Commissioned by Cornelis van Heemskerck, The Hague, 1782 (dfl. 425); sale, Rietmulder, The Hague, 18 November 1783, lot 73 (dfl. 221). Jacques Bergeon; sale, Doorschot, The Hague, 4 November 1789, lot 31 (dfl. 51,11). Anon. Sale, Van Marle & Bignell, The Hague, 16 December 1969, lot 143. E.J. Sluijter, 'Hendrik Willem Schweickhardt (1746-1797)', Oud Holland, LXXXIX, 1975, pp. 171/172 and 190, fig. 42. 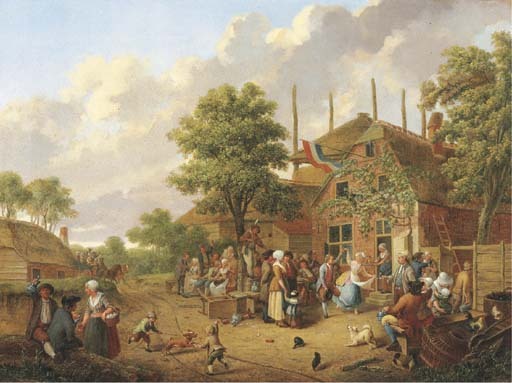 The present lot has as a pendant the 'Quack in a Village' (collection Rijksdienst Beeldende Kunst, The Hague). Both paintings are described in the artist's note book as being commissioned by Cornelis van Heemskerck in 1782. Sluijter (op.cit, p. 178) records that Heemskerck was Schweickhardt's most important patron, which indicates the significance of the commission to the artist. Schweickhardt's importance for Dutch painting in the 18th century stems from his adaptation of old formula's. Here he must have been inspired by works by Adriaen van Ostade and Cornelis Dusart. Sluijters compares its composition with Dusart's picture of 1674 in the Sinerbrykoff collection, Helsinki. In seeking inspiration from the masters of the artists.